I was a little torn having to trim my list of places to eat at during a recent Bangkok trip. I was mainly there for work and dinners would be the only time to have real decent meals. So I had to cut out a few things; giving up the trek to eat atop Chinatown’s gutters as well as some multi-course sit-down Thai places I’ve been wanting to try for the longest time. As we’re on the subject, you’d rarely find Thais in these so called hi-so establishments, preferring little-to-no-ambiance restaurants with just really good food. Quite a common trait among our Asian neighbors. But on our very first night, literally after just checking in, I made it a point to get to eat in what I would say is considered a restaurant for special occasions. It was, in fact, our first meal in Krungtep. Raan Jay Fai is a shophouse located in the older part of Bangkok. No busy shopping malls. No buzzing trains overhead. Interesting to point out a few blocks away is frenzied and boisterous Khao San Road; but on this street time would seem to have stopped. A few shophouses operate along the same stretch and Jay Fai is oft overlooked because of the famous pad thai place called Thip Samai a couple doors down. But if one has time I suggest to try this place out. 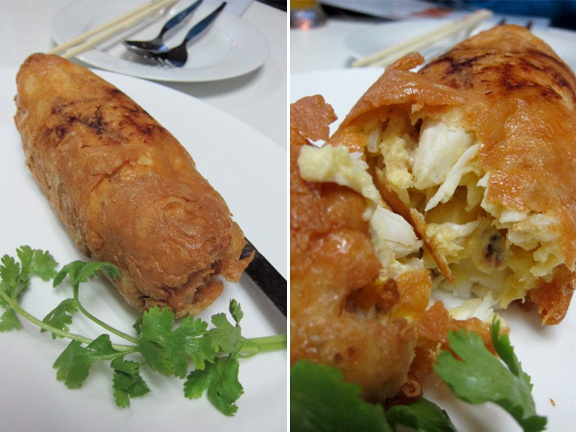 It’s a place famous for its crab omelette (kai jiao poo). I mean yes, on paper it sounds boring but you have to see it to believe it. It’s not what I’d classically classify as an omelette; the egg part is really just a thin crepe-like covering. But inside a thick, eggy tube you get massive chunks of sweet, sweet lump crab meat. It’s girth like that of a baby’s thigh. All crab. It’s price: Bht800 (about Php1100). It is not cheap. Especially by Bangkok standards; a regular crab omelette can probably be had for less than a tenth of the price. And Bht800 usually equates to a full on feast for about 5 people already under comparable settings. 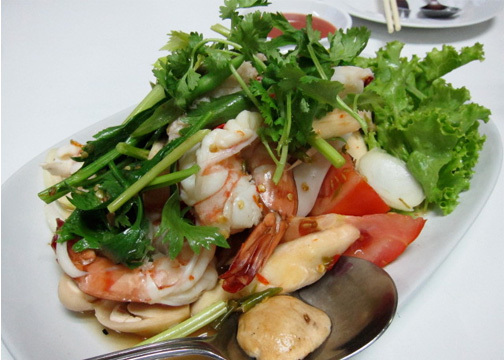 Yam ruamit talay (seafood salad) was also ordered. Our server had informed us that it was Bht600 (Php800) for that day; it followed a market price. A little hesitant but we still agreed. And what arrived was really just a platter-full of the biggest shrimp and squid. Real pristine stuff. There were also fillets of white fish; all poached till perfectly tender and tossed with tomatoes, cilantro, straw mushrooms and crispy, fresh palm hearts in a warm citrus dressing. It was seasoned precisely and it wasn’t cloyingly drenched with sugar as most restaurants tend to do with their dressings here. It was spicy, but not overly so as with most Thai salads. There was balance. If I’d usually be perfectly happy with a Bht120 seafood salad then this would be comparably over the top. And it was. 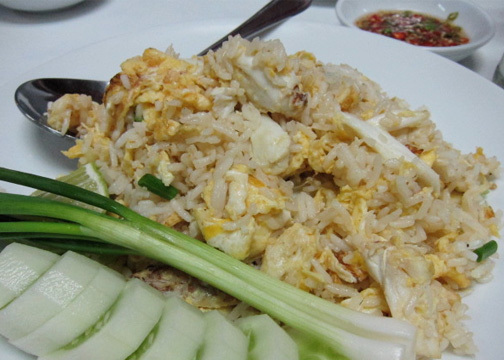 Crab fried rice (khao pad poo) also contained finger sized morsels of crab. The Thais have a way of frying rice that makes it taste just different. What we normally get in Manila is really more akin to a Chinese style. And the rice here was just smoky and moist and flavorful; you can actually eat it on its own as a one dish meal. 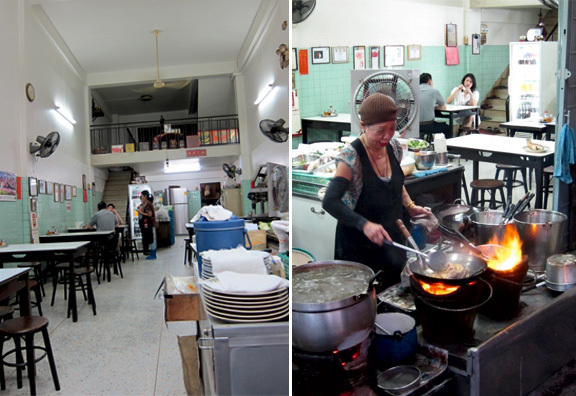 This place is also a famed noodle joint in its own right; quite popular for a dish called “drunken noodles” (pad kee mao) or this stir fried dish served till the wee hours of the morning. 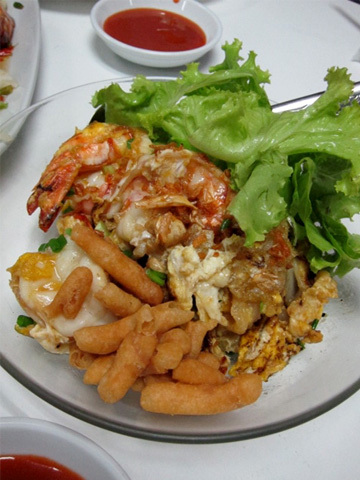 But we opted for the simpler guay-tiew kua goong or stir fried rice noodles with eggs and prawns (Bht360/Php500). Massive prawn, coated in egg yolks then flash fried. The noodles were coated in egg as well and was delightfully chewy. Topped with crispy crullers, much like shing-a-lings. The wok-hei, or that characteristic fragrance imparted by a hot wok, was pretty evident with every bite. A simple, delicious dish. What better way to pay our compliments to the chef by polishing off every single dish. The chef, by the way, is this tiny woman. Her kitchen literally out on the side street, making use of several coal fired stoves that give that special smoky flavor to every dish. Seeing her work her stuff is tantalizing to say the least. 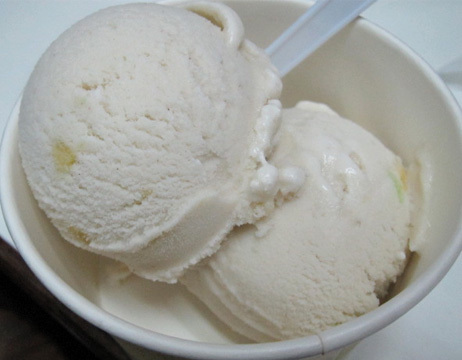 We had ordered some creamy scoops of coconut ice cream from the adjacent stall as a perfect end to our first meal. It was a nice recalibration of my tastebuds for Thai flavors once again. And it turned out to be one of those rare meals wherein you experience actual joy in simple, honest food. Hi Richy...In addition, food is generally tempered to foreigners' tastes in more upscale places and you lose a bit of that local flavor. However there are a few upscale Thai places that really want to push tradition. Though experiences and recommendations I get are mixed. Whereas on the street/in the markets 99% of the time I find great eats. For cheap! AP, I would like to meet this tiny woman chef. Also, that crab omelette looks exceptional. Most, if not all ingredients can actually be found locally. I guess it's just the technique, or someone attuned to Thai flavors to make it here. Paul, you've made me miss Bangkok SO much!!! I know what you mean. It's a great city.